As we enjoy the season of Christmas and prepare for it’s ultimate meaning, I have been wandering the internet considering other distinct holiday traditions that are not part of the American Yuletide season. Traditions like the Portugese Christmas morning meal with places set for dead relatives definitely caught my eye.The lines of Japanese trying to get into KFC for a traditional Christmas Chicken dinner entertained me (and reminded me of the power of advertising). And the Catalonian tradition of the “Caganer” statue found hidden away in Spanish and Italian Bethlehem scenes showing a man secretly relieving himself left me completely puzzled. 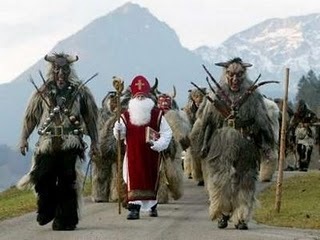 However, the Christmas season tradition that I couldn’t get off my mind was the “Krumpus” or “Krampas” from the Alpine countries of Austria, Germany and Switzerland. In the good old U.S.A. kids are put on a “naughty” or “nice” list, resulting in sweet gifts or a lump of coal in their stocking. 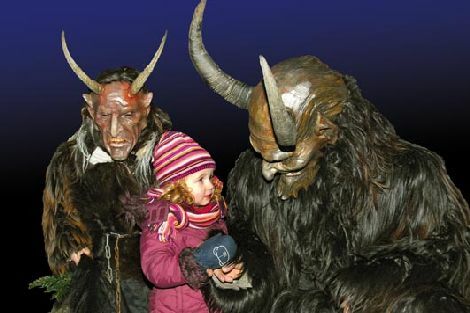 But in Germanic countries, an unruly or petulant child receives a holiday beating from a boozy, ill-tempered 7 ft goat man – the Krumpus. 3 weeks to shape up or instead of gifts they’ll receive a real beat down on Dec. 25th. How did these guys ever get reduced to a lump of coal in America? The only answer I could come up with: Liberals. This entry was posted on December 22, 2009 at 11:36 pm and is filed under Humorously Speaking with tags Alpine, Austria, Caganer, Children, Christmas, coal, December, Germany, Italy, Japan, KFC, kids, Krampus, Krumpus, Naughty, Nice, presents, Santa Claus, Spain, Switzerland. You can follow any responses to this entry through the RSS 2.0 feed. You can leave a response, or trackback from your own site.